The H1 Alpha is the first in Hummer’s new performance series and represents the single greatest advance in the 14-year history of the original Hummer. 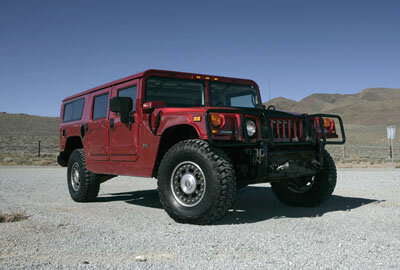 As was the case for previous H1 models, the H1 Alpha is offered in both Open Top and Wagon models. The 6.6-liter V8 engine delivers 300 horsepower at 3000 rpm. Peak torque is a massive 520 lb.-ft. at 1500 rpm. The added power enhances the vehicle’s already-extreme off-road crawling and climbing capability. On the road, the new powertrain offers smoother, quieter and more comfortable operation, with better acceleration. The five-speed automatic transmission is extremely stout and durable, as it also is used in medium- and heavy-duty commercial trucks. It features a Tow/Haul mode that adjusts shift patterns for optimal performance when the vehicle is towing or carrying heavy loads.